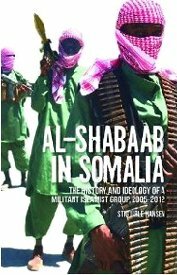 This November, The Columbia University Press will publish Al Shabaab in Somalia: The History and Ideology of a Militant Islamist Group, 2005-2012 by Stig Jarle Hansen (University of Life Science, Norway). The publisher’s description follows. Harakat Al Shabaab is Somalia’s infamous though under-researched militant Islamist group. An offshoot of the Islamic Courts Union, the organization seeks to impose Sharia law across the country, has been linked to acts of maritime piracy, and was until recently the de facto rulers of the land. Along with the group’s international connections to Al Qaeda and other Islamist networks, Harakat Al Shabaab is heavily involved in local clan structures. Combining intensive field research with interviews of Shabaab leaders, this volume builds a history of the organization while critically analyzing the roots of its resilency.